(Nanowerk News) Some atoms don't always follow the rules. Take the beryllium dimer, a seemingly simple molecule made up of two atoms that University of Delaware physicists Krzysztof Szalewicz and Konrad Patkowski and colleague Vladimír Spirko of the Academy of Sciences of the Czech Republic report on in the Dec. 4 edition of the journal Science. Beryllium is a strong, hard, toxic metal found naturally in minerals such as emeralds and commonly used as an alloy with other metals in many applications, from the tweeters of loudspeakers for public address systems to elements of nuclear weapons. For decades, scientists believed the two atoms that compose the beryllium dimer repelled each other. That follows a basic theory of chemistry that explains how the electrons in a molecule occupy different orbitals, says Patkowski, a postdoctoral researcher at UD who works in the Szalewicz Lab and was the lead author of the study. 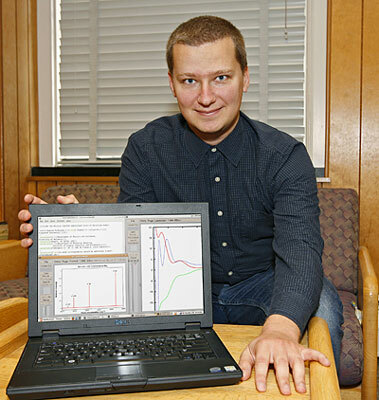 Konrad Patkowski, a postdoctoral researcher at UD who works with physicist Krzysztof Szalewicz, is the lead author of an article in the prestigious journal Science, confirming a 12th and highest vibrational level for the beryllium molecule. However, in the 1960s, scientists discovered that instead of repelling each other, the two atoms actually bond with each other. More than 100 theoretical papers have been published on this bonding energy, Patkowski says, but they report a wide range of predictions and the most trustworthy ones differed dramatically from the measured value. However, in May 2009, a scientific team from Emory University reported in Science the results of an experimental study that recorded the vibrational energy of the bonding atoms for 11 levels, finally reconciling the experimental and theoretical models. "A molecule vibrates, so the distance between atoms changes in time. A molecule can't just sit there and not vibrate," Patkowski explains. "The more vibrational energy a molecule has, the farther its atoms stray from their equilibrium positions." In this latest issue of Science, the UD-led team confirms a 12th and highest vibrational level for the beryllium molecule, thanks in part to their Czech colleague Spirko's expertise in "morphing," which enables researchers to make simple changes to the theoretical interaction energy curve to agree with experimental findings. Morphed versions of this potential energy, fitted to experimental data, closely reproduce the observed spectra. Patkowski notes that the UD study was close to completion when the Emory team published their results. "Their results agreed with our study, so it was really gratifying to see the previous mysterious disagreement between experimental and theoretical numbers from the past disappear. Their work showed us we were going in the right direction," Patkowski notes. The beryllium dimer is commonly used in benchmarking studies in experimental and theoretical physics, yet the molecule is anything but common, Patkowski says. "It's a prototype system that is small and nasty, both for experimental studies, because of its toxicity and reactivity, and for theoretical studies, because standard quantum chemistry methods work very poorly here," he notes. "The interesting thing about this molecule is that basic chemistry knowledge tells us that the atoms are not going to bond, but they do -- and it's a pretty strong one. It's a nice model for developing new theories of molecular physics," Patkowski says.